Every year I visit the San Francisco Decorator's Showcase with my dear friend, Diana. We like to see the new trends and the magnfiscient historic home that has been transformed by the country's best designer's work. This year I was taken by a room that had ombre walls. (Definition: use ombre shadow, shade; darkness, obscurity.) The walls of this particular room were dark blue at the top where the wall meets the ceiling and it shaded down gradually until the bottom of the walls were white. I've seen ombre dresses and shoes, but I have never seen ombre walls. There was a "women's suite" that had a color palette of camel, sky blue and fuchsia, the combination was fantastic. Here at the Showcase House you see side tables, art and light fixtures up close that you see in magazines such as Metropolitan Home, Elle Decor and more. For most of us, we do not have the budget to hire a designer for our Oakland or Berkeley homes, but go to the Showcase House to get ideas and implement one or two into your house. The showcase house runs through 5/26/08. For more information about the San Francisco Decorator's Showcase House, click here. 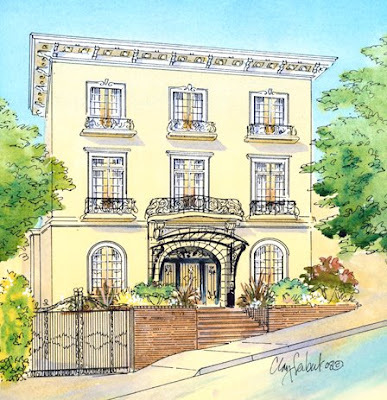 Photo Sketch of the Showcase House is courtesy of their website.